 Torrance (Comparative Literature/ Univ. of California, Davis) illuminates the human search for the transcendent in tribal religion and 20th-century thought. All life, argues Torrance, is continually going beyond its given condition, and for human beings this movement becomes conscious and purposeful, so that we can speak of ourselves as the questing animal, with as much validity as the rational animal. Torrance introduces his study by discussing the views of anthropologists such as Durkheim and Bergson; the psychological thought of Freud and Piaget among others; and philosophers of language, in particular, Chomsky and Saussure. He bases his exploration on ethnographical evidence, since similar practices among seemingly unrelated tribal peoples argue well for the frequency, if not universality, of the quest in humankind. Torrance discusses myth, rites of passage, and the phenomenon of spirit possession, but the main part of his work is devoted to shamanism. The shaman, he argues (following Eliade), is an active agent who wins mastery over the world of spirits. We learn how the shaman operates in Australia, Tibet, the Americas, and among the Inuit. For example, human sacrifice became the only conceivable response of Nezahualcoyotl, the poet-king of Texcoco, whose quest turned to despair because of the belief in the imminent extinction of the sun and the world. Torrance describes how the shaman is often initiated into his role involuntarily by strange dreams and how self- transformation through ritual death and rebirth enables him to cure others. The author concludes with a brief but rich review of the thought of Ricoeur, Pierce, Popper, Plato, and others, suggesting, rather obscurely, that the object of the human quest continually eludes us and is somehow in a process of formation in which we ourselves play a part. 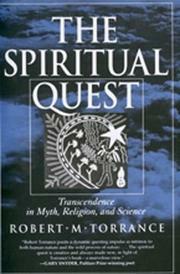 Torrance's book is remarkable for the wealth of fascinating detail drawn from so many cultures.